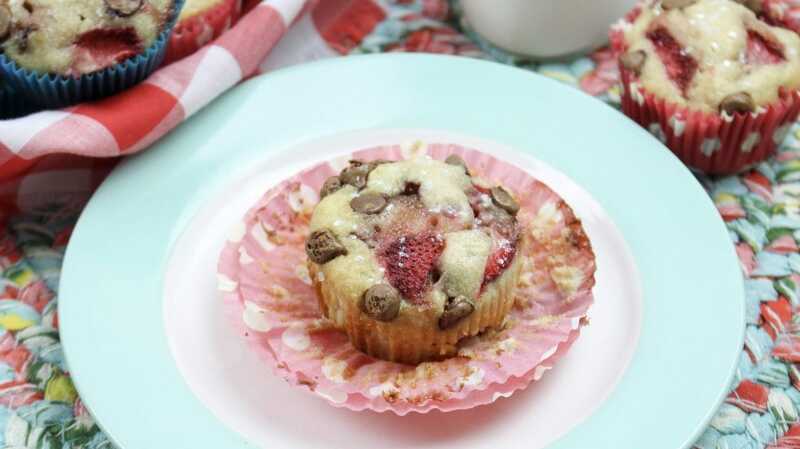 I have a delicious strawberry and chocolate chip muffin recipe to share with you today. 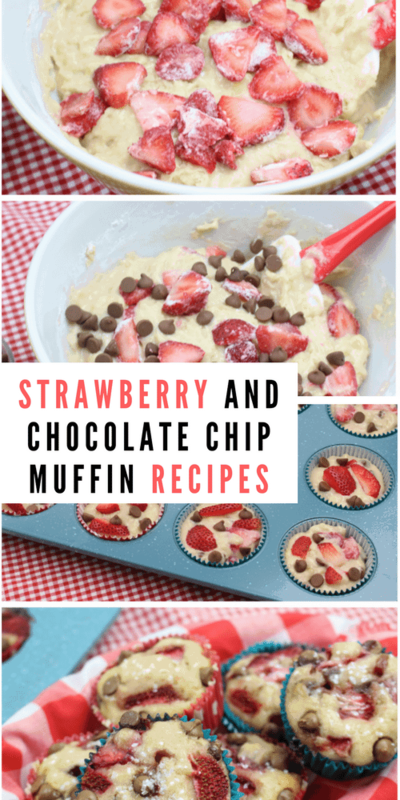 My kids love to wake up to something sweet on the weekends and this muffin is such a treat! In fact, Natalie is now old enough to handle these instructions on her own. That’s one of the beauties of having a teen daughter. They start baking! If only I could get her to actually clean up after herself. It would be a total win. Small steps, people. Small steps. 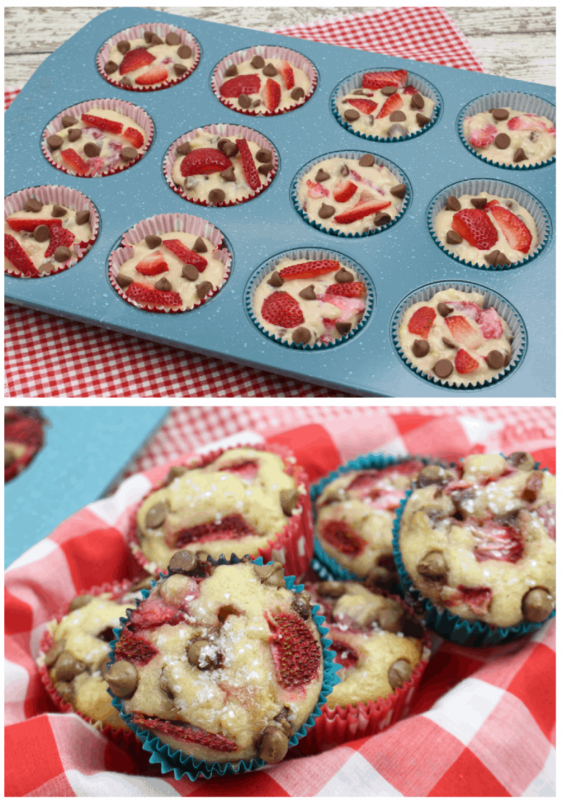 I hope you enjoy this Strawberry and Chocolate Chip Muffin Recipe! Odds are you have most of these ingredients on hand. 1. Preheat oven to 350°. Line your muffin pan with 12 cupcake/muffin liners and set aside. 2. Mash both bananas in a large mixing bowl. Add the egg, melted butter, milk, yogurt and vanilla and stir until mixed well. Set aside. 3. In a medium mixing bowl, add 1 1/4 cup of flour, baking powder, sugar, and salt. Whisk to combine. 4. 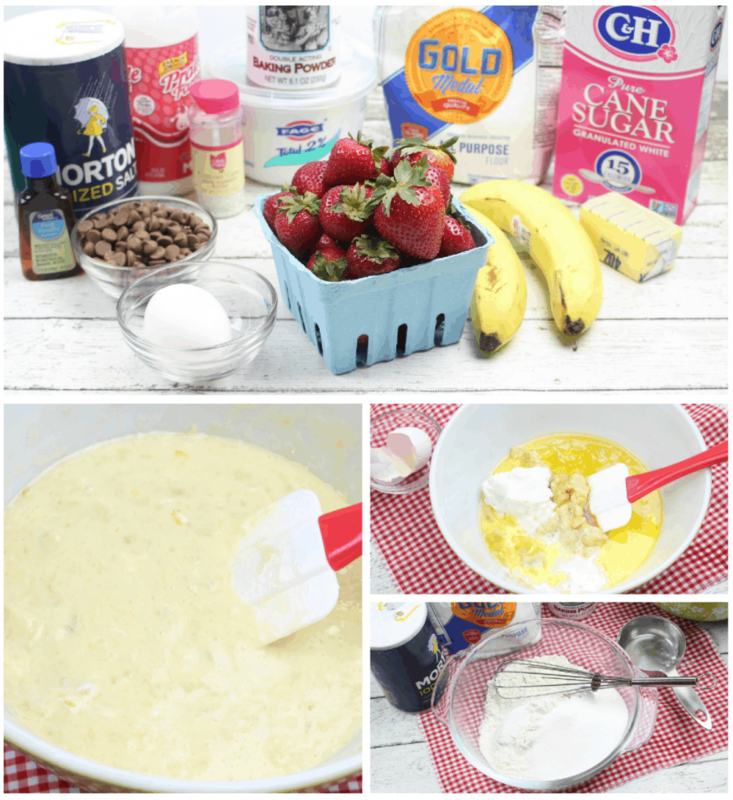 Add the dry ingredients to the mashed banana mixture and gently stir until all ingredients are wet. Do not over stir. 5. Add your sliced strawberries to a small mixing bowl and sprinkle 1 Tablespoon of flour over them. Gently toss to coat. 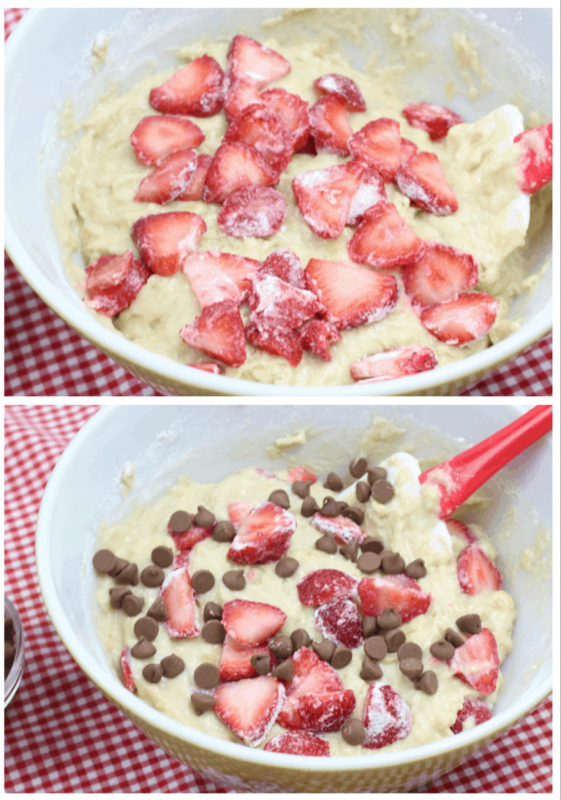 This will help prevent the strawberries from sinking to the bottom of the batter. 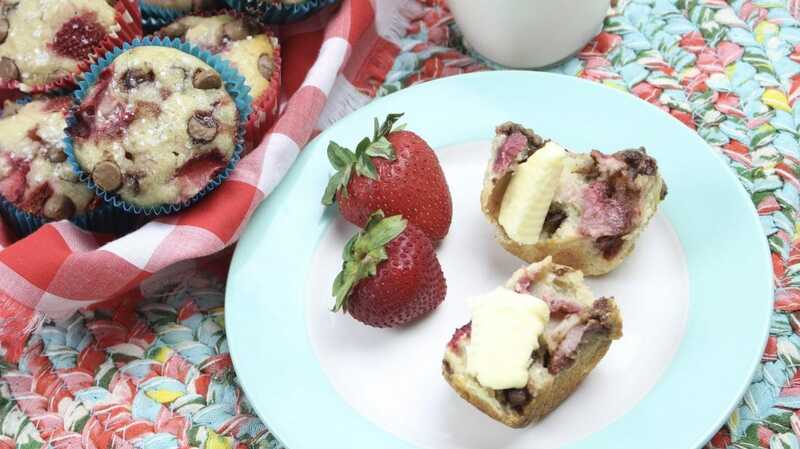 Gently fold the strawberries into the muffin batter. 6. Fold in the chocolate chips and pour batter into each muffin liner, filling 3/4 of the way from the top. 7. 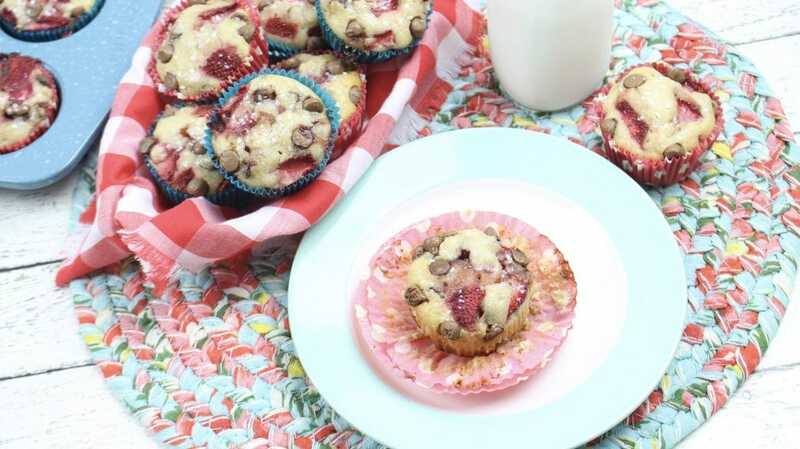 Optional – sprinkle coarse sugar on top of each muffin. 8. Bake at 350° for 20 to 22 minutes or until an inserted toothpick comes out clean. 9. Cool the muffins in their pan for 5 minutes before transferring to a wire rack to complete cooling process. What do you think about this recipe? Something you’d like to try?